Th-INK-ing of You: Another Sneakie Peekie! Hello friends! I'm excited to be sharing another sneak peek with you today! I created this card for this week's Featured Stamper Challenge on SCS, and I'm using a set to be released Feb. 1 by Our Daily Bread designs called Earth's Gladdest Day. I LOVE this set and the sentiments in it are great! I know this is a lot of white space for me, and very CAS, but I'm trying to learn how to make a CAS card look good, and today's featured stamper sure had some beautiful CAS designs to help me learn! 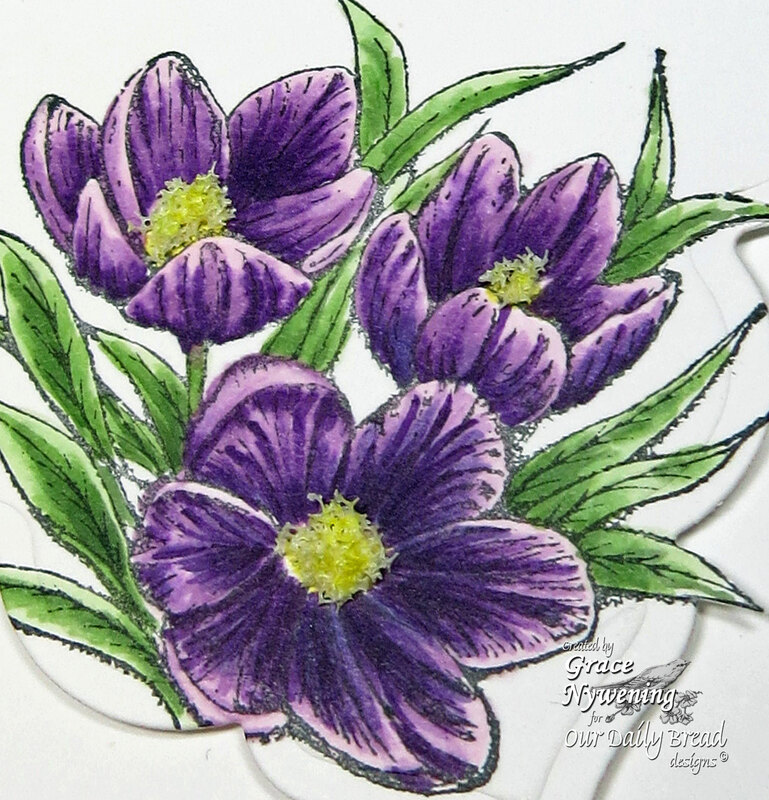 I stamped my image with Memento and colored with Copics, and then I added some Flower Soft to the centers. I cut the main panel with Spellbinders Labels 23, and then pierced the border of the mat. 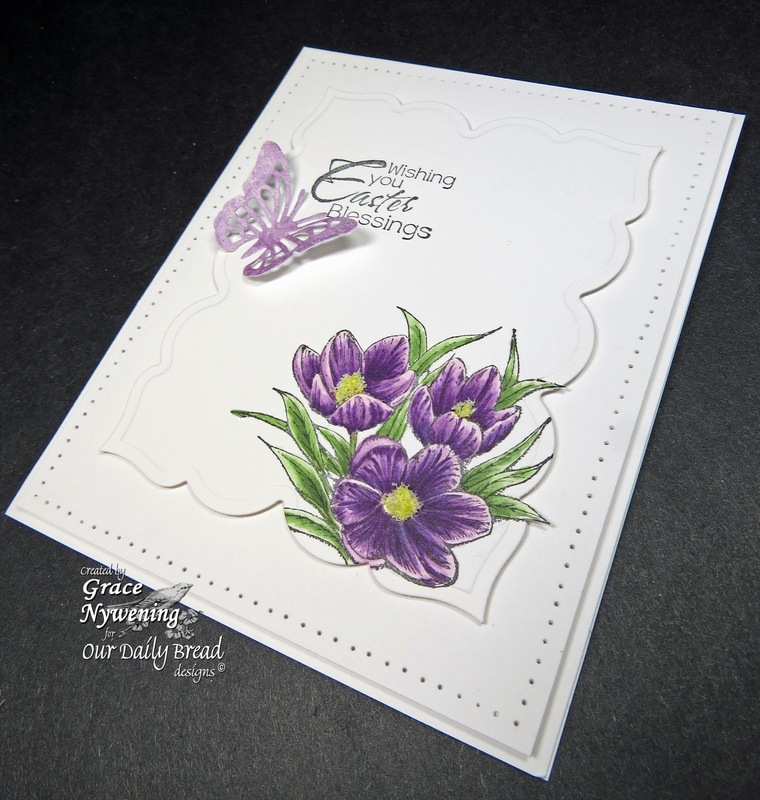 I stamped one of the sentiments from the set in the upper left corner and added a Cheery Lynn Mini Exotic Butterfly die cut. Easy peasy! No wonder so many people love CAS! It can actually be done quick and that is a GOOD thing! LOL! Well that's it for me tonight! Hope you had a great weekend, and are ready to see what God has for you in the week to come! I hope to see you back here Feb. 1 for our awesome blog hop!!! Beautiful and i love your stamps thanks for sharing. Wowzer Grace!! You are just whipping out these beautiful cards!! Great job with the new release!! I just love your coloring and the CAS design. You sure rocked it!! The flower soft is a beautiful addition!! Absolutely stunning! It's elegant and beautiful, Grace. Your cards are always SUCH a delight, and I love having you share them with us. May God bless you this week for sharing and being such a blessing to all of us. LOVE your sweet art, girl! Your card is amazing. The coloring is so real looking. Your work is always delightful. OH Grace, I love white on white with splashes of color! This is stunning, and love those flowers. Gorgeous card, Grace! I love all the white space with just the splash of color from the beautiful image! Wonderful coloring! Gorgeous flowers Grace! 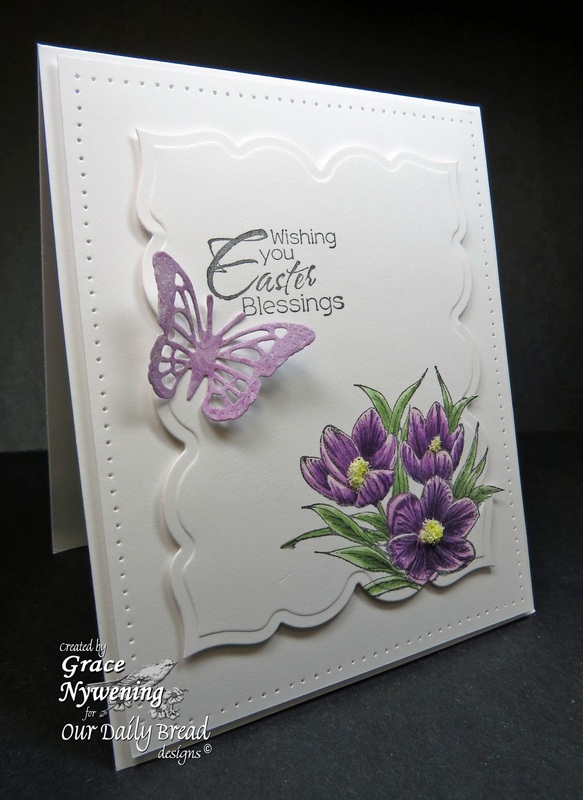 I love this CAS Easter card and the pierced border adds a nice touch. Thanks for joining us at The Squirrel and The Fox. This is really pretty, just love all the white with the splash of colour in the corner. Looks fab! Absolutely breathtaking Grace!! You and I are on a similar journey with respect to CAS cards - I too am trying to learn the art of CAS. You my friend have proven that you are there with this beauty! Eine wirklich wunderschöne Karte in tollen Farben. Grace: Your card is ssssso beautiful & classy. Glad you joined us at Simply Create Too for Challenge #29 - "Anything Goes"--Come by this Friday for our new challenge? So lovely, very elegant. Thanks for joining us at Challenges 4 Everybody. Good Luck!